IT'S hard to imagine that just 50 years ago the thriving town of Ocean Shores was the site of dairy farms. The township - now the largest residential town in the Byron Shire - has a colourful past, one that Ocean Shores Community Association president Jan Mangleson has watched unfold. Jan and her husband Jim moved their young family from Sydney to the region in 1972 and are now helping to oversee the 50th birthday celebrations, which started with a birthday party on March 30 and will continue throughout the year. Other events include the Ocean Shores Art Expo on August 23-25. The opening night will feature a special Ocean Shores Golden Jubilee Art Award of $1000 for an art work on the theme of A Moment in Time at Ocean Shores. Other plans include a celebration of more than a century and a quarter of education in the Pocket Valley and Byron Coastal North and a fun run from Devine's Lookout to the river. "We originally moved to the nearby town of Mullumbimby where we bought a house and ran a small retail business," Jan said. "We then bought 129 acres on Mt Chincogan and bred Poll Hereford beef cattle." However, they were always involved with the fledgling town. "Jim is one of the founding members of the Ocean Shores Golf Club," Jan said. "In 1979 we started a real estate business which is now operated by members of the second generation of our family. Our children grew up on our farm and went to local schools. Jim and I now live in Ocean Shores. "We take great delight in our grandchildren and now have great grandchildren. "All our family agree that moving out of Sydney to this wonderful Northern Rivers gave them a heritage and a lifestyle they deeply appreciate." Jan said the end of March was a significant date for Ocean Shores - marking the start of development. "Fifty years ago on March 29, 1969 hundreds of people gathered at the iconic Roundhouse, Pat Boone's Ocean Shores Administration Centre, overlooking the Pacific Ocean," she said. "S.T. (Steppa) Stephens MLA, the local Member of Parliament and also NSW Minister for Housing and Co-Operative Societies, officially opened the building, making way for the development of the new resort town of Ocean Shores. 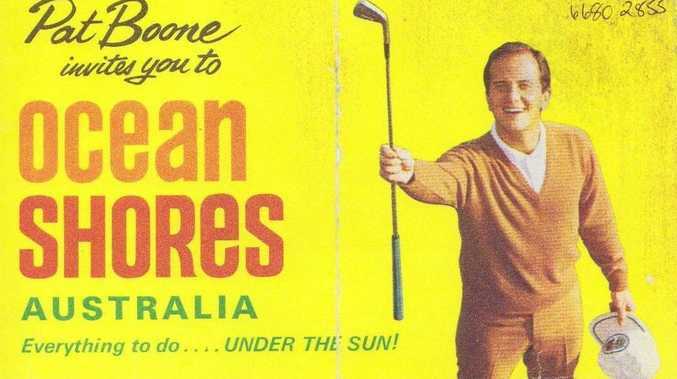 "Famous pop singer of the day Pat Boone was engaged by (developers) Wendall West to come to Australia to market the development. It was said at the time that in the '60s and '70s Pat Boone was more famous than Elvis Presley." Though he didn't come out for the party, Boone was still involved in the celebrations. "As part of our 50th birthday celebrations, James Cotta, chair of the Ocean Shores Country Club board, met with Pat Boone at his LA office on Sunset Boulevard in Beverley Hills in March," Jan said. "Pat is now 84. His wife died early this year. He was, however, pleased to speak with James and to send a message to the people of Ocean Shores wishing us well for our 50th birthday celebrations. He was there when it all began." The town had an interesting and colourful birth. "The first company Wendell West Australia Pty Ltd bought 12 dairy farms of cleared land, the entire coastal area from the north of the Brunswick River up to the Tweed Shire border on Wooyung Rd," Jan said. When Wendell West (which had Ocean Shores developments in the US as well) went into receivership in the US, Princess Properties Pty Ltd took over the development of the Australian Ocean Shores, completing Stage 1 of the development, now Ocean Shores South, and part of Stage two, around the Capricornia Canal. "The new town of 1500 residential lots was born," Jan said. "Professor Robert Sully, an architect and town planner from Los Angeles, designed the Roundhouse and the town of Ocean Shores South. "The town was designed on a curvilinear pattern following the contours of the site rather than the old square grid pattern. "Electrical power lines and telephone went underground for the first time in Australia in a private development." For more details, go to oceanshorescommunity .org/media-articles.